Those of us “of a certain age” recognize that old photographs preserve special moments. Before today’s ever-present digital devices allowed indiscriminate picture-taking, a photograph was reserved for a special occasion, due to the cost and bother of film developing. For example, my dad pulled out the camera only to record a rare family trip or the celebration of birthdays and holidays. During past eras, the Christmas photo figured prominently in many families, including those who lived at Glenbow. As faithful readers will recall, I have spent several years researching the now defunct village of Glenbow, located in present-day Glenbow Ranch Provincial Park. One of my roles in the Glenbow Town and Quarry Project of the Archaeological Society of Alberta (Calgary Centre) has been to contact descendants of those who lived and worked there during the early 20th century. Many of these descendants have shared stories and photos that help us piece together not only the physical organization of the site, but also what life was like for the inhabitants. Two families have contributed photos that were taken at Christmas. The first set of pictures comes from the Capewell family. William Capewell arrived in Glenbow in 1910, and worked as a machinist, turning stone at the quarry. When he had saved enough for their second-class fares (an improvement on his arduous third-class travel), he sent for his family. 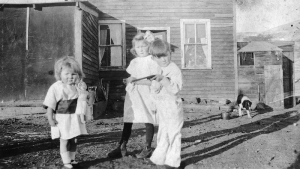 William’s wife and three young children arrived in September 1911 surprised to find their accommodation was merely a tent. Eventually, likely at the urgings of his wife, a new two-room shack was built and supplied with a refurbished stove, to provide heat as well as cooking facilities. 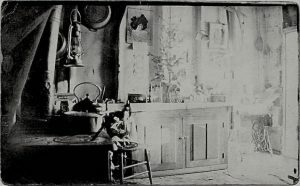 William had a camera and the images he snapped are the only ones we have of the interior of a Glenbow home. Regrettably, as they were taken with only indirect sunlight from the open doorway, their quality leaves something to be desired. 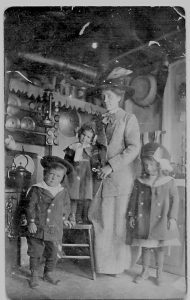 The first image shows Gertrude Capewell with her three children: William Jr., little Gertie standing on the chair, and Hilda. This photo reveals that although every available surface was used for storage, feminine decorating touches were not overlooked, as shown by the zig-zag trim hanging along the shelf edge. Another view of the shack interior suffers from greater exposure challenges. However, two dolls can be seen sitting on the chair, warming themselves by the stove. A calendar displaying the chilly month of December hangs on the wall beneath the smiles of a lovely Gibson Girl and just visible on the cupboard to the right are the Christmas tree, adorned with candles, and a toy horse and wagon underneath it, awaiting excited little hands. Unfortunately the year is not discernible on the calendar, but this image is likely from Christmas 1912 or 1913, as the family returned permanently to England in March 1914. The second set of Glenbow Christmas photographs date from a decade later and come from the Currey Wearmouth family. The eldest child, Stennard, acquired a camera at some point and was responsible for recording several family events. The first image, handily labelled “Irene + Roy, Xmas Day, Glenbow. 1924,” is one of the most useful we have. Several important details were captured. Firstly, there is a conspicuous lack of snow; in fact, the historical data on Environment Canada’s website indicates that the third chinook of December blew into Calgary on Christmas Day. Secondly, this late afternoon shot reveals the passage of the eastbound train in the background and, on the far right, the shadow of 15-year-old Stennard as he snapped the picture. Thirdly, we see hints of what was going on inside the house: their mother, Betty, peeks out the doorway, possibly washing up the pots and pans from the holiday meal, while a Christmas tree festooned with ribbon graces the front window. For archaeologists, the most important information recorded in this image is the structure itself; its complexity reveals its development since its initial construction in 1910 and reflects the addition of seven more children to the family group over the years. Today, the site is covered in waist-high vegetation which disguises the cellar pit; none of the structural detail shown here is evident on the ground surface. Another photograph taken at the same time embellishes this Christmas story. Elder sister, Nellie, has arrived on the scene in time to witness Roy demonstrating his Christmas present by pointing it at Irene’s treasured gift (one can hope, anyway). In the background, the family dog is about to partake in the Christmas repast. Little did these Glenbow families know that their holiday snapshots would become so valuable. Their wish to record special moments of accomplishment, celebration, and even humour has preserved details of their lives that they took for granted. 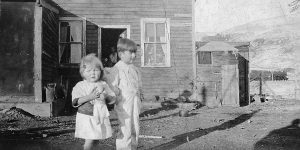 To the archaeologists studying their former community, these Glenbow residents (and their descendants) bestowed a great gift. Through these images we can decipher their physical homes and see the range of possessions housed therein, none of which may have been preserved in the archaeological record. Additionally, we gain an appreciation for ethereal structures, such as the organizational systems and cultural norms of past eras. But more importantly, we glimpse the values, jokes, and even love that these families shared with each other so long ago. May you and yours have a Happy Holiday Season and may it be preserved forever in well-lit photographs.